Gainsborough and the Theatre at the Holburne Museum. By bringing together some of Thomas Gainsborough’s finest portraits of his friends in the theatre, this exhibition will create a conversation between the leading actors, managers, musicians, playwrights, designers, dancers and critics of the 1760s-80s. Gainsborough & the Theatre explores themes of celebrity, naturalism, performance and friendship through some of the most touching likenesses by ‘the most faithful disciple of Nature that ever painted’. Bringing together some of Gainsborough’s finest portraits of leading actors, managers, musicians, playwrights, designers, dancers and critics of the 1760s-80s, this exhibition will explore themes of celebrity, naturalism, performance and friendship. Gainsborough and the Theatre will include 37 objects, including 15 oil portraits by Gainsborough, works on paper (including satires, views of theatres and playbills) and ephemera from public and private collections across the UK. Following the Restoration of the Monarchy in 1660, theatre became an increasingly popular pastime, with existing playhouses enlarged and others newly commissioned throughout London and the provinces – particularly in Bath, where the Holburne Museum is located. 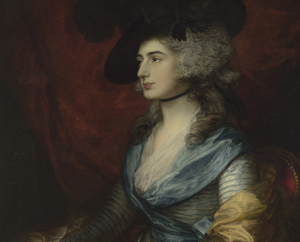 In 1759, 32-year old Gainsborough arrived in Bath, accompanied by his wife and two daughters. Having already garnered a reputation as a skilled portraitist, he soon found a keen clientele among Bath’s fashionable (and well-off) visitors. Gainsborough’s arrival in the West Country coincided with the rising wealth and social status of leading actors, such as James Quin and David Garrick, both of whom he painted. His friendship with the pair opened more doors for him, both in Bath and then later in London. The two actors also enabled Gainsborough to explore naturalism in portraiture, just as they and their contemporaries were turning to less artificial forms of performance in theatre, music and dance.